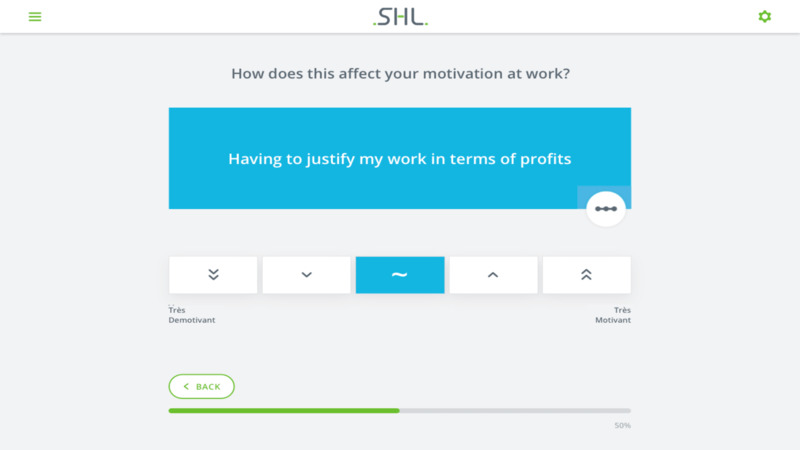 The SHL Motivation Questionnaire (MQ) Assesses situations that are likely to increase or reduce the individual’s motivation to work. The more motivated and engaged your workforce is, the greater your organization’s potential for success. However, motivators, such as recognition, development, and flexibility often differ widely depending on the individual. Thus, assessing for motivation allows an organization to understand what really drives candidates to excel. The MQ measures 18 dimensions of motivation and provides a comprehensive profile of the motivational factors that affect an individual’s work performance. Candidates read statements that describe a situation or condition and then rate each statement as to how it would affect their motivation to work. The Candidate Motivation Report—Allowing candidates to understand what drives their own motivation and encouraging them to take greater ownership of their development plans. Supplement these reports with our one-day Motivating Others workshop that helps line managers understand and apply motivational management techniques effectively within their organization. The MQ includes a maximum of 144 items with an estimated completion time of 25 minutes.